Second time's a charm? If we're talking me and marathons, then the answer is yes! 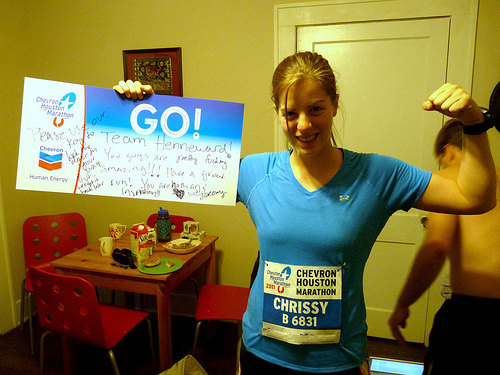 Here, my friends, is the long awaited recap of the Houston Marathon. Grab a snack and get comfortable, because it's a long one! We live two hours from Houston and our good friends Vicki and Jeromy, who had just moved to the city for an internship, offered to let us stay with them the night before the race. We decided to come down on Friday evening instead, so we'd have time to hang out in addition to running the marathon. We left work early on Friday and made it to Houston in time for dinner. Vicki and Jeromy treated us to a night on the town which involved three bars and an extremely decent dinner at a Thai restaurant. 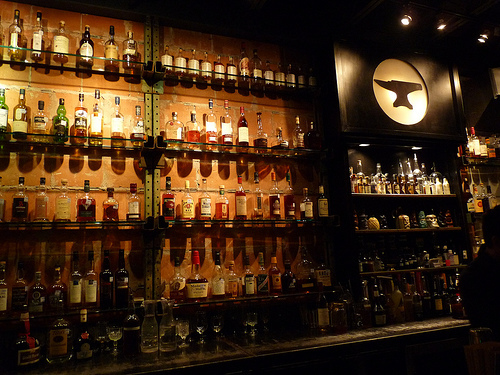 The highlight of the night was a bar called Anvil, which featured the fanciest drinks I've ever seen. Delicious, too! We ended up staying awake until nearly 3am, which is probably not the best thing to do two nights before a huge race, but which was definitely worth it. 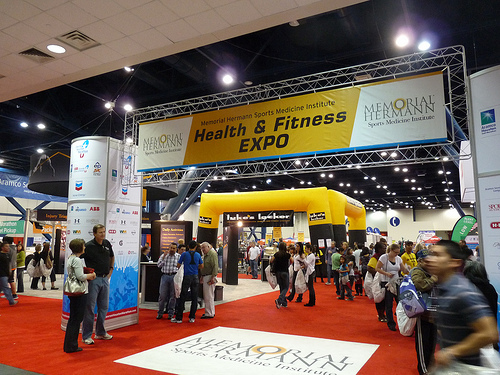 We woke up late and slightly hungover Saturday, but fixed that problem with a delicious brunch at the Empire Cafe, lots of coffee, some shopping and then a trip to the Houston Marathon Expo. It was an awesome expo and I scored a ton of free Larabars, sample boxes of granola, a pair of toe socks for my Vibrams and brochures for races all over the world. (A girl can dream!) We also saw our friend Chip who was volunteering with the Brooks booth - you can read his recap here. After picking up our race packets and goodie bags, we went to see a movie (Biutiful, which was a fitting name - a haunting meditation on life and death - see it if you can!) and then grabbed dinner at Whole Foods which, along with staying with awesome friends, is now our official pre-marathon tradition. We did both these things for Houston and for Austin, and if it ain't broke, don't fix it! In the days leading up the marathon, I'd been glued to weather.com, watching as the predicted percentage of precipitation grew larger and larger, until race day was calling for 100% chance of thunderstorms, with daily emails from race officials warning us of possible delays and cancellations. When the alarm went off at 4:30am on Sunday morning, I grabbed my phone and checked the weather for the thousandth time - miraculously, the chance of rain had dropped to only 20%. Oh, happy day! Nathan and I got dressed. I had a pumpernickel bagel with peanut butter and a small cup of coffee and soymilk. We were on the road by 5:20 and, after a tense half hour stuck in traffic, milling around the starting line by 6:15. Nathan was in the first wave, which started at 7:00am, and I was in the second wave, which started ten minutes later. 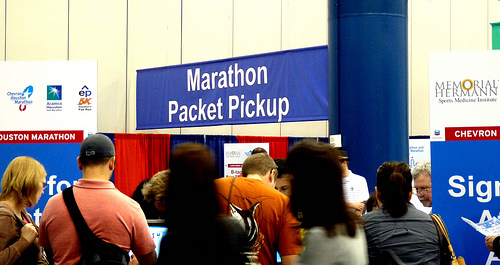 I was very impressed with the pre-race organization - even though 7,342 marathoners and 9,472 half marathons were running, it never felt too crowded or hectic. I lined up at the front of my wave with the 4:15 pace group leaders and nervously waited for the gun to go off. It was 60 degrees when we started, with 99% humidity and light rain. Could have been better, but definitely could have been worse! At exactly 7:10am, we were off! 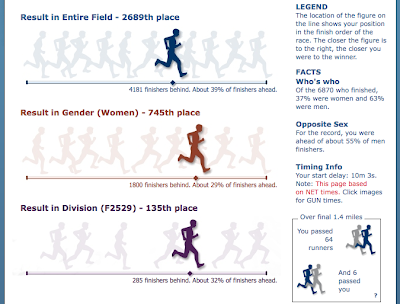 To reach my goal of finishing in 4:15, I had to maintain an average pace of 9:43 minutes per mile. For the first five miles, I ignored this and stayed ahead of the pace group, which I knew was a bad idea but I couldn't help myself. While the rain scared off some of the spectators there was still a nice crowd, and I really liked running through Houston. Nathan and I lived there for a summer and visit fairly often, so it was great to see so many familiar sights. The pace group caught up to me at around mile 6, which was nice. One of the pace leaders was very funny and entertaining - half tour guide, half comedian, and fully dedicated to flashing her sports bra at the frat houses through Rice University and doing a push up at every single mile marker. If you have the opportunity to run with a pace group, I highly recommend them! I chatted with some of the folks running around me, but mostly I just focused on my own race. I had a few gels and alternated between water and Gatorade at each station, and I grinned every time someone yelled my name or told me I was "looking good!" It was a very uneventful race, and for a moment I was even thinking about how quickly it was going by and how great I felt. This was before I got to mile 18. At mile 18, things started to fall apart. It rained heavily at one point and my shoes were just wet enough to rub a giant blister into my right toe. I grabbed a banana from an aid station but could only stomach three bites. My pace began to slow and as the 4:15 pace group faded into the distance, so too did my goal for the marathon. I was surprisingly okay with this - I knew 4:15 was pushing it, especially in the rain and the humidity, and I also knew that I was currently giving the marathon everything I had. I started running a 10:30 pace and managed to maintain it for the most part. Miles 20 through 25 were the hardest, but I expected this. I was in pain - blisters and soreness and exhaustion were all setting in. But I pushed on and only allowed myself to walk through the aid stations, while drinking water. When I saw that there was only a mile and a half left I dug in and picked up my pace. 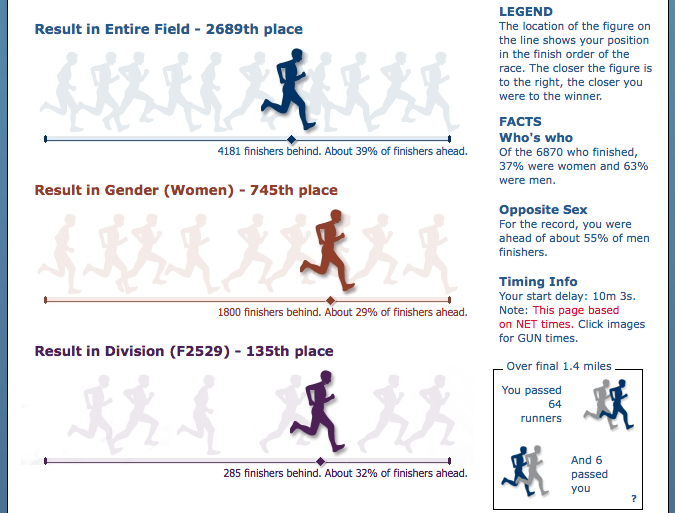 According to the marathon's fancy statistics, I passed 64 people in the last 1.4 miles! 64 people! And when I finally crossed the finish line, I thew my arms in the air, slung my medal around my neck, and got as far away from the marathon course as possible. 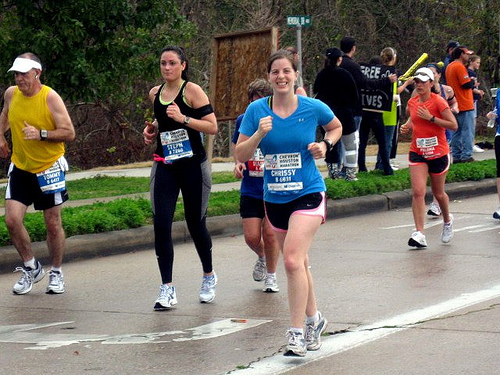 After last year's Austin Marathon, I was so overcome with emotion that I cried as soon as I crossed the finish line. At the end of Houston, I didn't even let myself think about what I had just done. I had blinders on, and the only thing I could think about was shower, food, and a comfortable chair. Later, Nathan and I discussed the marathon in alarming detail - what we saw, what we felt, how our bowels cooperated (very well, thanks for asking! ), signs we liked, parts of the course that we favored, how many calories we took in. We're still talking about it, three days later. But in the moments after the race had ended, we sat in silence in the car and simply enjoyed the feeling of doing nothing. Nothing can feel pretty wonderful. Vicki and Jeromy were awesome hosts and even better spectators. In addition to appearing twice on the sidelines of the course to cheer us on, Vicki took the two action photos earlier in the post, and Jeromy filmed both Nathan and I as we ran. By the time we got back to their apartment, he had already edited the video and made us a copy. Amazing! I love this video, but I am not too pleased with my form - especially at mile 23! It was uphill and I was very tired, so that's my excuse. But still. Still! And of course, my mile splits courtesy of the Garmin. I was doing so well until mile 18! And you can clearly see how I was struggling to maintain a decent pace during the last few miles. I love the story that numbers can tell. After a shower and a delicious lunch at Niko Niko's, Nathan and I made two hour drive back to Nacogdoches. We were a little sore and very tired but feeling pretty good, considering. We went to bed at about 8:30pm and when we woke up at 6:30 the next day, I could barely walk. My thighs were so, so sore, my blisters were as big as my toes, and I was still hungry, tired and dehydrated. We called in sick to work and spent the day on the couch, which was just perfect. Yesterday I was still a little sore, but much improved, and today my legs feel almost 100% back to normal. The only lingering evidence of my 26.2 mile jaunt through Houston is a very tender and sore spot on the outside of my right foot. Any pressure causes pain, which is annoying. I would like to go to yoga this week at least once, but I'm not sure if that's wise. I'm going to give it another day or two and see how I feel. I'm sure I'll keep y'all updated! 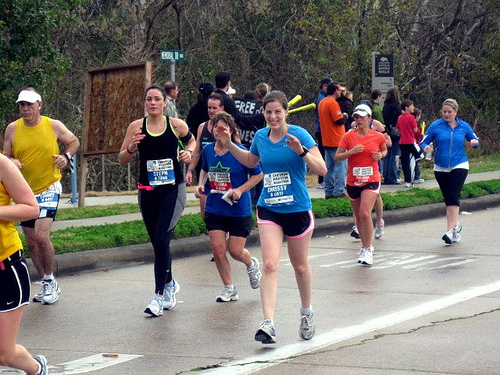 And that concludes my very long and overly detailed race report for the 2011 Houston Marathon! Thanks for reading until the very end and for all your kind words, comments, tweets and messages along the way. It's been a long journey and I'm glad that it's over (for now, that is! ).